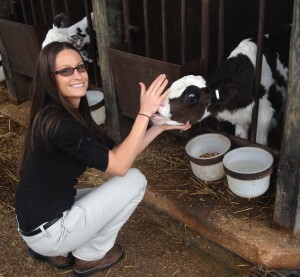 Class III Fellow Lauren Torres enjoys a visit with the calves at Hopkins Farm Creamery. The LEADelaware agricultural leadership development program is a two-year fellowship program consisting of a series of seminars held in locations in Delaware. There is also a seminar (study tour) in Washington, D.C., and there is a study tour at an international location. LEADelaware class participants are called Fellows. LEADelaware is about providing training and information, support, direction, and resources to people who are choosing to become leaders, and skills gained through the program may be applied to activities of the home, farm, place of work, industry, all levels of government, natural resources and environmental interests, the community, organizations, etc. There are 10 seminars within the two-year program, and time will be needed to travel to and from the seminars. The seminars are one to three days each (sometimes involving an overnight). Classes are held during the week, not weekends. Factors such as available facilities and instructors for each seminar or current issues may determine exact dates and schedules. Seminar days can be long, with speakers and guests at most group meals, and breakfasts often starting by 7:00 a.m. and the evening dinner programs often concluding at 8:00 or 9:00 p.m. Full attendance and participation is expected. There is an attempt to keep the seminars as enjoyable, light and fun as possible while we learn about some serious topics. We try to mix and vary the teaching techniques used (some lecture, tours and field visits, role playing, discussions, assessments, hands-on learning, etc.). Ultimately, it will be up to each individual person to determine how much he or she will get out of the experience and how the individual will apply what is learned. The program provides many opportunities, but it will be up to the individual on how best to utilize the training, the new contacts and networking opportunities, resources, information, and leadership examples. Besides the general topic or theme of each seminar, leadership skills and discussions will be included within most seminars. We will also attempt to learn more about the economics, history, citizens, leaders, agriculture, natural resources, and current issues of the community or region hosting the seminar. Plan on committing a minimum of 20 days to attend seminars. No doubt that you will need time to prepare and be organized so that you are ready to participate and be at your best during the seminars, and to have home and work obligations met or covered so as to minimize distractions or preoccupation during the seminars. Please arrive at the seminars thinking of it as attending class in a retreat setting. Though breaks are taken throughout the day, not every seminar will offer a lot of time to make phone calls or complete other projects. Also keep in mind that phone access may be limited in times of tours or when staying at some rural facilities. Plan on using 8-14 days for an international study tour, depending on the international travel destination(s), the time of year for travel, the needs of the class, the overall budget, etc. There will be assigned reading and studying outside of the seminars, but these will be reasonable in length. You are expected to put some time into the program between seminars. Fellows will be expected to come prepared for the sessions and at times present, organize, introduce, and contribute to the sessions. Do plan to check your e-mail often for program news and updates! 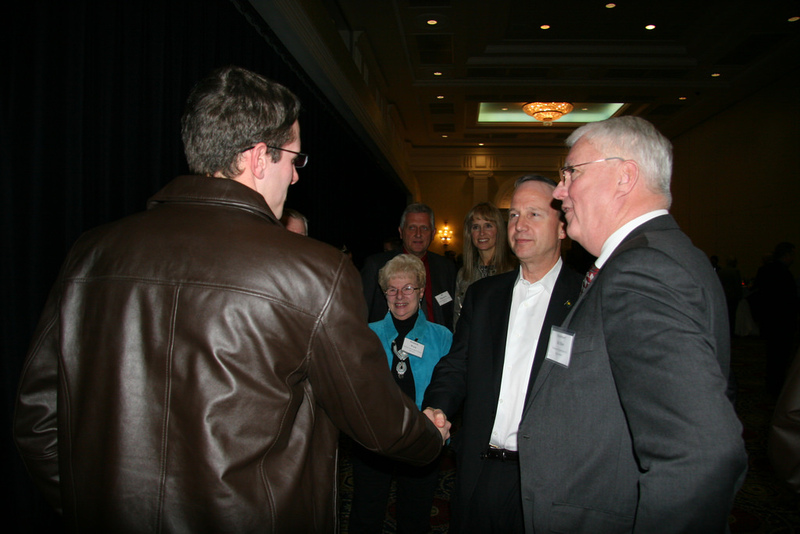 LEADelaware Class III Fellow Philip Dukes meets Governor Markell at Ag Industry Dinner. Fellows occasionally are invited to attend events important within the agriculture, natural resources, and rural communities, which are not mandatory for the completion of the LEADelaware Fellowship, but are optional opportunities Fellows may want to enjoy. Dress for the seminars is commonly business casual (pants other than jeans, collared shirts—button-down or golf/polo shirts, or sweaters, optional jackets and ties and the equivalents for ladies), but there are times where business dress (suits) are more appropriate. During some outdoor activities or tours, casual attire (jeans or shorts, T-shirts or other casual clothes, athletic shoes, hiking boots, etc.) works best. Information about what to expect during the seminar will be sent out ahead of time to help you in packing and planning. Details of the seminars will take shape as time progresses, and as the earlier seminars begin to reveal the highest priority needs and interests of the participants of this specific class. Factors such as available facilities and instructors for each seminar may also ultimately determine schedules. The seminars may also be scheduled and planned to react to current news or new developing issues of interest to leaders in agriculture, natural resources, or rural communities. Details of each seminar will be e-mailed to Fellows usually a few weeks prior to the actual seminar. For more immediate planning purposes, please use the calendar as listed below. Seminar topics and locations are described in very broad terms and more detailed objectives will be shared with the class for each seminar.